The Next-Generation Transit Survey (NGTS) has achieved first light at ESO’s Paranal Observatory in northern Chile. This project will search for transiting exoplanets — planets that pass in front of their parent star and hence produce a slight dimming of the star’s light that can be detected by sensitive instruments. The telescopes will focus on discovering Neptune-sized and smaller planets, with diameters between two and eight times that of Earth. The Next-Generation Transit Survey is a wide-field observing system made up of an array of twelve telescopes, each with an aperture of 20 centimetres. This new facility, built by a UK, Swiss and German consortium, is located at ESO’s Paranal Observatory in northern Chile and benefits from the superb observing conditions and excellent support facilities available at this site. NGTS is designed to operate in a robotic mode and it will continuously monitor the brightness of hundreds of thousands of comparatively bright stars in the southern skies. It is searching for transiting exoplanets and will reach a level of accuracy in measuring the brightness of stars — one part in a thousand — that has never before been attained with a ground-based wide-field survey instrument. This great accuracy of brightness measurement, across a wide field, is technically demanding, but all the key technologies needed for NGTS were demonstrated using a smaller prototype system, which operated on La Palma in the Canary Islands during 2009 and 2010. NGTS also builds on the success of the SuperWASP experiment, which up to now leads in the detection of large gaseous planets. The discoveries of NGTS will be studied further using other larger telescopes, including the ESO Very Large Telescope. One goal is to find small planets that are bright enough for the planetary mass to be measured. This will allow planetary densities to be deduced, which in turn provides clues about the composition of the planets. It may also be possible to probe the atmospheres of the exoplanets whilst they are in transit. 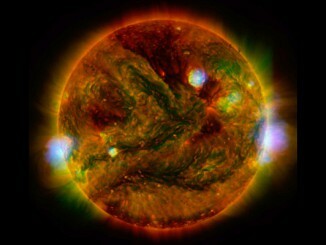 During the transit some of the star’s light passes through the planet’s atmosphere, if it has one, and leaves a tiny, but detectable, signature. So far only a few such very delicate observations have been made, but NGTS should provide many more potential targets. This is the first telescope project hosted, but not operated, by ESO on Paranal. Several telescope projects operating under similar arrangements are already at work at the older La Silla Observatory. The NGTS data will flow into the ESO archive (http://archive.eso.org) system and will be available to astronomers worldwide for decades to come. The NGTS Consortium is composed of the University of Warwick, UK; the Queen’s University of Belfast, UK; the University of Leicester, UK; the University of Cambridge, UK; Geneva University, Switzerland and DLR Berlin, Germany. In his third report from the Royal Astronomical Society’s NAM2015, Kulvinder Singh Chadha examines the Sun in X-ray and ultraviolet wavelengths from three different spacecraft, dons a virtual reality planetarium headset, and investigates if the proposed James Webb Space Telescope (JWST) could discern Earth-sized worlds that are habitable. 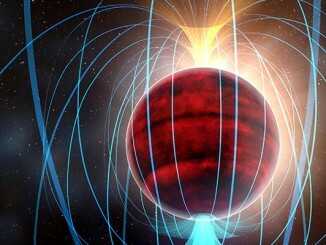 A dim red dwarf star with just one-tenth the mass of the Sun has been shown to possess a magnetic field so strong that its average strength rivals that of the most extreme active regions on our Sun. 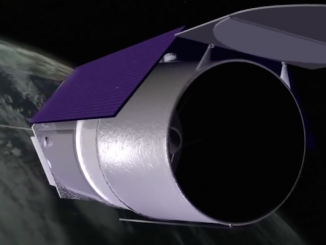 NASA officials expect to officially kick off development in February of a multibillion-dollar observatory recycling a grounded top secret spy satellite telescope capable of studying dark energy and directly resolving planets around other stars.